(PRLEAP.COM) Dr. Greg Sawyer of Los Gatos, CA received an Orkos Award for excellence in a case study report involving non-invasive treatment for an infected dental implant. 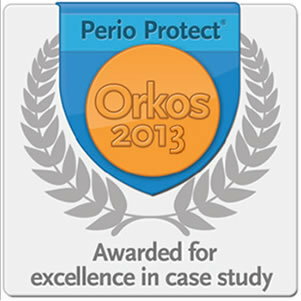 The Orkos Award was established by Perio Protect, LLC to celebrate the excellent work of dental professionals treating gingivitis and periodontitis. The award also recognizes individual contributions in minimally invasive dentistry. This is the first award given for an implant case. For people who have lost teeth due to disease or injury, dental implants offer a permanent tooth replacement option with an artificial "root" anchored to the jaw bone. Implants can help restore the appearance of your smile and make eating easier and more enjoyable. Dr. Sawyer placed an implant for a patient missing a tooth in August 2007. The crown for the implant was placed the following February but, by April 2009, the implant had become infected and the bone support around the implant was ailing with four implant threads affected. Patients who lose their teeth due to gum disease are primary candidates for dental implants, however gum disease can return around implants. This happened to Dr. Sawyer's patient. Treatment for the disease started immediately with systemic antibiotics, followed by several office visits to irrigate and clean the ailing implant. The tissue however remained infected, tender, and swollen. To help resolve the infection, Dr. Sawyer recommended prescription Perio Trays® to deliver medication around the implant at the site of the infection. Perio Trays are custom fabricated for individual patients and used to place medication around teeth and under the gums long enough for the medication to be effective. This patient received Perio Trays and medication on June 16, 2009 for use in short daily intervals. In September 2009, after three months of treatment, microscope analysis for Dr. Sawyer's patient determined that samples around the implant were clear of infectious microorganisms. Tissue health had improved significantly and was maintained at the following dental recall visits in October 2009 and January 2010. In May 2010, patient records indicated new bone around the implant. An x-ray taken May 2012 shows a gain of two threads of bone on the implant. At the most recent periodontal maintenance visit in July 2013, there was no sign of infection around the implant. It has remained stable for four years. Dr. Sawyer has more than six years of experience treating patients with Perio Tray® delivery. The technique fits nicely into his full service cosmetic and family dental practice, where he promotes minimally invasive treatment. "Every procedure performed in our office," Dr. Sawyer explains, "is as conservative as possible, preserving as much healthy tooth structure as the dental team can." Perio Protect applauds Dr. Sawyer's approach and his practice. 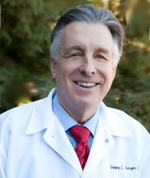 For more information on Greg Sawyer's dental team and services, please visit www.losgatosdentalgroup.com. For additional information about the Orkos Award and the current winners, go to www.theorkosaward.com. 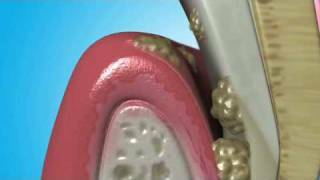 To learn more about the Perio Protect Method®, visit www.perioprotect.com.